Navigate big tables with Jump to...Section 1Section 2Section 3 . Click ↻Mobile View if the full size page is hard to read on a small screen or window. Click to minimize/maximize the gray command box. Change table groupings with Category & ScoreMagazine & CategoryCampbell & Author . Changing the grouping to Magazine is useful if you're a magazine subscriber. Grouping the Campbell page by Score after seeing it by Author could help prioritize your reading. 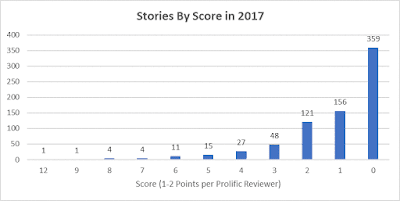 Highlight stories with Price... Magazine... Guide... . An highlight occurs if a highlight intersects an existing highlight (such as the Best SF/F and Locus lists). See your ratings with My Ratings . They're grouped by Category to simplify Nebula and Hugo nominations. 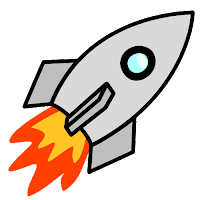 Backup your ratings with (BETA Feature). It updates the URL with your data, which can be saved in your browser as a date/time stamped bookmark. If your browser replicates bookmarks across platforms, access the bookmark from another device to transfer your ratings. Repeat after you use each device. Don't forget to update your most recommended novella at the top of the post since "And Then There Were (N-one)" now has a higher score than "Nexus." Thanks for the reminder but I decided to remove the list of three because it's too much work to manually maintain. Understandable. Easy enough to scroll down and see in context with the other recommendations anyway. I only count 86 novelettes here. Also, "Don't Press Charges and I Won't Sue" is actually a short story (it's shown as such on its review page). So 85 novelettes and 130 short stories--unless I'm not seeing something. I copy/pasted the story into Word and it came to 7,757. It's also listed as a novelette in the Locus list. See Greg's reply to my comment at File770. Later Charlie Jane Anders confirmed that it's a short story. Oops. Eric was out of town when I made the update. That's why we didn't communicate about it. Are you going to do a best editor page this year? We decided not to do it this year. In the past, it's been a lot of work to collect all the statistics, and it didn't seem that anyone made much use of it. Truthfully, it was really a method that only worked for someone who rated stories the same way I did. 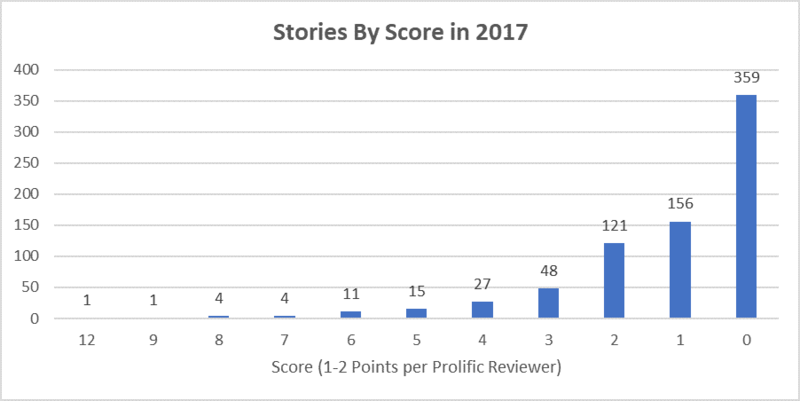 What we'll try to do next year, now that we have a system to let readers rate stories themselves, is provide something that will do similar computations using the reader's ratings, not mine. That should be far more useful. Cool. I figured you weren't at this late date, but you do still have it mentioned here as "coming soon."